Embrace a truly diverse job working with a great group of people. Develop a career that means something, without sacriﬁcing life at home. Oh, and enjoy the view. 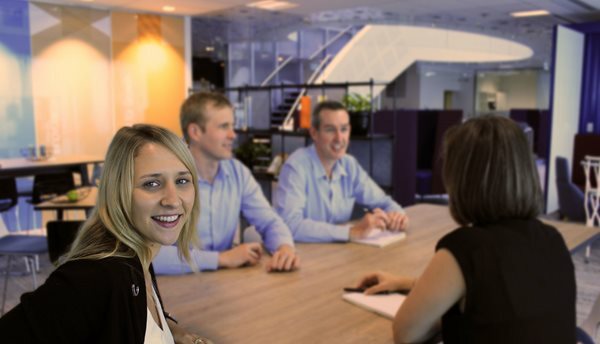 As a Port of Brisbane graduate, you’ll work on real projects right away. From marine operations and security specialists to property managers, strategic developers and administrative experts, our team is truly diverse - so whatever your discipline, it’s likely no two days will be the same. The very nature of what we do means new challenges, new tasks and new projects are always on the horizon. As we innovate in a changing industry, we need people who get the job done and then help us do it better. Our best people do that every day. But don’t take it from us, listen to what our Grads have to say. Applications are now open for Port of Brisbane’s 2019 Graduate Opportunities in the areas of Environmental Science, Trade Development and Civil Engineering. As a Port of Brisbane Intern in your second last year of study, you’ll have an opportunity to apply your academic knowledge in a real world setting. You’ll be welcomed and mentored by your manager and your team to gain hands on experience across concept, design and implementation of real projects. You’ll benefit from the know-how of our experienced long-termers and the fresh ideas of new experts and you’ll build trusted relationships across the Company to build your professional network. Applications are now open for 2018/2019 Summer Internships. Find out more and apply now. Where could a Port of Brisbane Graduate opportunity take you? Rob started with Port of Brisbane as a Civil Engineering Graduate and now leads our Infrastructure team delivering world class projects and maintaining a unique portfolio of assets with a value in the billions. We asked Rob about his experience and the growth of his career from Graduate to General Manager of our Infrastructure team. I joined Port of Brisbane as Graduate at age 20, when I look back at those early years I consider myself very fortunate to have joined a Company that has always strived to grow, to deliver outstanding projects and to look for better ways to do things. This gave me the opportunity to work on very diverse projects – whether it was in a master planning, designing or project managing capacity. Projects I’ve worked on include an Urban Renewal, a Cruise Terminal and the Brisbane Multimodal Terminal as well as wharves and many roads around the Port precinct. The diversity of the projects and opportunities to work in roles outside of Engineering gave me an understanding of many different challenges and future proofed my skills in an industry that’s rapidly changing with technological advancements and the need to deliver projects safer, faster, more sustainably and more efficiently. The Port has also encouraged and supported me in furthering my education, having gained a Master of Commerce in 2005 which has helped me grow my career through the Engineering and Project Delivery streams. The many industry experts I worked alongside in my early career took the time to mentor me and share their technical knowledge and leadership expertise and this had a huge impact on my career. I’m keen to give the same support to new Graduates coming into the business, I’m also excited to be reverse-mentored and gain from their new ideas and perspectives! I would strongly encourage Graduates to pursue a career with Port of Brisbane. This is a Company that values different ways of thinking and challenges the status quo every day. For Graduate Engineers it’d be hard to find a more diverse engineering experience and welcoming culture. We’re best suited to Graduates that want to challenge themselves and others, to identify strategic opportunities and to have a direct impact on the direction of the Company. Jess joined Port of Brisbane as a work experience student, before joining permanently as an Environmental Graduate and within 18 months has progressed to leading our Sustainability initiative. We asked her about her experience. I grew up in a coastal town and was always interested in coastal processes and industry so from early on I knew I wanted to apply what I was learning in my Environmental Science degree within a Port setting. I was thrilled to be given the opportunity to complete work experience with the Port of Brisbane team. I still feel very fortunate to have secured a permanent Graduate role within a Company with such diverse environmental challenges. I never expected to be working on such big projects straight away – one of my first tasks was to take a lead role on our Target Zero project which was very challenging at first and threw me out of my comfort zone but I am now very proud that we’ve already achieved a significant reduction in our total waste across the organisation. I really couldn’t describe a typical day here, there’s so much variety - whether I’m presenting to school group, in the office obtaining permits or assisting with the many environmental monitoring programs across the Port precinct including monitoring water quality out in the bay, the health of mangroves and even whales. When we used Drones as part of the mangrove monitoring program I was able to see firsthand how technological advancements will deliver huge improvements in how we work – and I’m excited to see what’s next! It’s important to me that I’m contributing to the Port maintaining a balance between operational and environmental requirements, and from my first days as a work experience student I could see that the rest of the team shares my passion and this is reflected in our long term strategy. I’m lucky to have joined such a supportive team – there’s always a lot of laughter here! My degree gave me a strong knowledge base but where I needed a lot of support was in the practical application. My manager and my team have been instrumental in me developing those much needed practical skills through structured training opportunities or taking the time to show me on the job how things are done. I feel very fortunate to find myself leading the Port’s Sustainability initiatives relatively soon after completing my University degree, but that really speaks to the opportunities available at the Port – if you enjoy a truly diverse role and you’re energetic about your own development and improving how things are done, this is a place where you can create your own opportunities.